These guys are my friends. They know I carry snacks in my pocket. 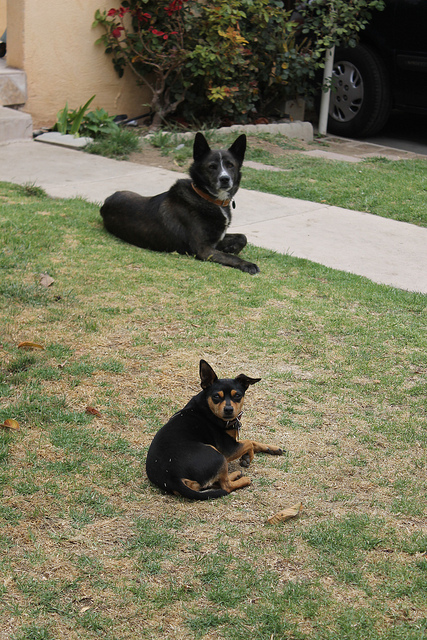 I call them “Old Man” (the big dog) and “Killer” (the tiny one, who has a big bark). My little dog is a social beast, and she makes friends everywhere she goes. Dogs that used to try and tear Goldie apart through the fences stop and wag at Abbie. She charms them by standing with her head dipped, wagging easily until they crack and become friends. This includes Max, a giant of a deaf German Shepherd with bad hips, who barks at almost everyone. She also charmed JR, another old guy on my block, who hated Goldie as well. There are two massive grey pit bulls with cropped ears who have fallen under her spell, standing goofily at the fence, grinning at her cute face. The only dogs Abbie hasn’t charmed are the tiny hounds of hell – a whole yard full of snarling Chihuahuas that race to the fence and slam their tiny bodies against the bars, spitting and biting. For those guys, we cross to the other side of the street. It’s the little ones you have to watch for. Ask me how I know…. Yes. Though a sweet chihuahua is very, very sweet. I was going to say what Kizz did. I was terrorized by a neighbor’s dog when I was a kid. I would take a 20 minute detour out of my way to avoid it. It was a black and white chichuahua. They are FIERCE. Just a blur of bodies and tiny snapping teeth! And so LOUD.